Ladakh 2 Days Trip – Is it Possible & How ? When someone asked me for the first time about a Ladakh 2 days trip, I thought that person was joking. But then I realized that he wasn’t joking; and was actually thinking about visiting Ladakh over a weekend. What I couldn’t understand however was that why would a person want to do that. I mean, Ladakh is a place that you consider for 2 weeks and not 2 days. It is not your usual weekend getaway where you can just pack your bags and go. A trip to Ladakh needs time and careful planning; and after the recent boost in tourism, it has gotten crowded and expensive too, so you will also need budget planning. But then after some inputs and help from my side, that person actually visited Ladakh in 2 days. He flew there on a Saturday morning, was in Ladakh for the weekend, took an early morning flight to Delhi and was back at work by 10 AM. Crazy? I couldn’t agree more. What I stated above was an incident from last year July. Surprisingly, in last few months, I have heard this question so many times that I actually thought about posting this information here. So if you too were wondering about a Leh Ladakh 2 days trip over a weekend; then in this article, I will first tell why you should give up the the idea. But if you still however decide to do it then I will also tell how you can plan this journey; and what are some of the important things you must keep in mind. This will be the first and the biggest concern with your trip. You are not visiting a hill station nearby. You are going to Ladakh; a cold desert consisting of high altitude passes, unforgiving weather and challenging terrain. There is really no way that you can escape acute mountain sickness (AMS). Slow gain in altitude is the best prevention against AMS which doesn’t really happen here. With a couple of hours, your gain in altitude will be tremendous and it is bound to trigger symptoms of AMS. To know what these symptoms are; and how can you be affected; please read How to Handle Acute Mountain Sickness in Ladakh. I wish I could tell you a way around it but I really can’t. You will definitely be suffering from AMS on your first day of the trip; and may or may not get better on second day. The only thing to add here is that if your condition worsened anywhere while traveling; you must rush back to Leh city and seek medical attention immediately. I think it quite goes without saying. For a 2 days trip to Ladakh, you will have to book flights in and our of Leh city. There is no way that you can make this a road trip. A private taxi can be your only mode of commute and that too should be booked in advance; so that the driver can pick you from the airport directly. You just do not have time to travel any other way. You cannot rely on public transport of course; but also, cannot go around renting motorcycles. First is because finding and renting a motorcycle will eat up your half day at least which you cannot afford. Second is that with AMS hitting you hard, there is no way that you will be in a mood to ride around on a bike all day. So yes, for a weekend trip to Ladakh, you will have to book a private taxi and have the driver pick you from the airport. Inner line permit is a permit that you will need to travel beyond Leh city; towards Nubra valley or Pangong Tso. This permit can either be applied for online; or obtained in person from DM office Leh. For more details and related charges, please read How to Obtain Inner Line Permit in Ladakh. Neither of this however is a choice for you. Like renting a bike, getting ILP too will eat up at least half of your day. So the only option you have left then is to book a taxi driver who can also arrange permits for you. So that way, when he picks you from the airport that morning, he will bring the permits along and you can be on your way. Yes, this journey will last only 2 days but will be a costly affair for a weekend trip. First of all, you will be traveling by air which will cost you several thousands. Your biggest expense will however be of private taxi. For 2 days, you will end up paying about Rs. 15,000 just for the cab. So including the flight tickets, taxi rental, accommodation and meals, your trip will cost you about Rs. 30,000 for 2 days; depending on how much you paid for your flight. The only way to reduce this cost will be if you were traveling in a group of 4 – 5 people who can share the cost of the taxi. Without any doubt, this will be a taxing journey and you will end up traveling all the time. You will board a flight, land in Leh and then board a taxi from there. Entire day you will be on the road while suffering from AMS and then reach a hotel at night. Next day you will be back on the road and then circle back to Leh. Third day early morning you got another flight to catch. Continuing from the point above, after staying on the road all day, last thing you would want is to go hotel hunting in the evening. So for both days of your travel, you should book your stay in advance. Where you need to book is mentioned in the travel plan further in the article. So after considering all of the above, final part is of drafting your itinerary. Your travel plan will be for 2 days and very simple. Or an alternate version of the travel plan can be as below. This is the only way that this trip can be done. You cannot reduce the time any further. I am mentioning it because someone asked me this question; if they can return home on Day 2 itself. The answer is no you cannot. If you want to come back on Day 2 then you should stay in Leh city itself and not go anywhere at all. The only place you will see in Ladakh then will be Leh city. There are two ways that this journey can be done; and both have their pros and cons. The first thing to do here would be to book a flight that can get you to Leh as early in the morning as possible. Contact your taxi driver the day before; ensure that he has arranged for the permits and ask him to pick you from the airport directly. After you arrive in Leh, take a brief break for some breakfast if you want to. Then you would start on your way to Nubra valley while crossing Khardung La on the way. Once you arrive at Nubra valley, you have two choices. You can either stay here for the night or go back to Leh. This will completely be your personal choice. Going back to Leh will be beneficial in terms of medical assistance. Since you would anyways be suffering from AMS, you can get medical assistance in Leh city if your condition worsened overnight. This assistance may not be available in Nubra valley. Staying in Nubra valley could be beneficial because then you would have the entire day to explore the valley; otherwise you will just get here and immediately start on your way back to Leh city. As I said, it is completely your choice. My recommendation would be to decide based on how you were feeling that day. If you were not at all well because of AMS, then a wise thing would be to get back to Leh for the night. If your condition however was not too bad then you may stay in Nubra valley. Diskit has the largest number of hotels here and is the preferred choice of stay. Also read: How to Plan a Solo Trip to Ladakh? If you decided to stay in the valley, then spend the day sightseeing at the Diskit monastery, Hunder sand dunes and double hump camel etc. Plan for this day is to visit Pangong Tso. Route details of this day will depend on where you spend the night on Day 1. If you came back to Leh city from Nubra valley, then you will reach Pangong Tso via Chang La and return the same way. Ensure that you get an early start so that you get some time to spend on the lake; and to take sufficient breaks on the way. From Leh, you will drive till Karu and then climb up Chang La. Spend some time at the pass, click some pics and then drive until Pangong Lake. Have your lunch at any of the dhabas at the lake; and be on your way back to Leh by 2 PM latest. If you however stayed at Diskit then this day could be a bit more interesting. Start as early as you can, possibly by 6 AM from Diskit. Your first destination for this day would be Panamik, a small deviation. See the hot water springs here, have breakfast and continue traveling to Pangong Lake via Shyok road. The travel time between Nubra and Pangong via Shyok is about 5-6 hours so plan accordingly. You will then arrive at the lake, spend some time sightseeing, have lunch here and be on your way to Leh latest by 2 PM. This will be a long journey; and it will probably be dark by the time you reach back Leh city; but you will explore a lot of places. Also read: What is an Ideal Itinerary if you are Flying to Leh? Book an early morning flight out of Leh city; and make sure that you have informed your taxi driver to pick you from the hotel. There is no transport available so early in the morning here so you will have to make arrangements. Do let your hotel owner know as well because at night, they will lock the hotel down. You do not want to be standing at a locked gate in the morning with no one available to open it. A couple of other alternate versions of the journey can be as below. 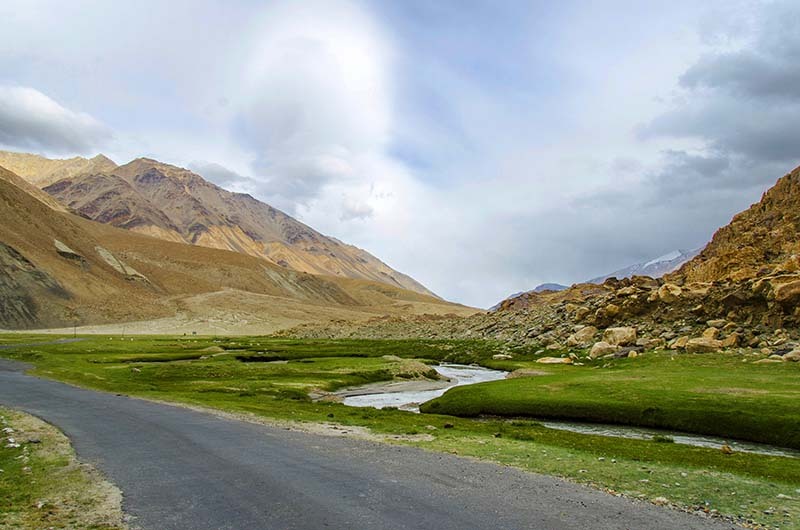 Day 2 – Take a drive to Nubra Valley and return to Leh. Another version can be like below where you will give up Nubra valley in favor of Pangong. Day 2 – Take a drive to Pangong Tso and return to Leh by evening. Fly out on Day 3. And that will conclude your 2 days weekend trip to Ladakh. It will be rushed, expensive, tiring and silly but at least you would have caught a glimpse of the paradise that Ladakh is. I hope this information was of help. If you have any further questions; or need any other details; please feel free to ask in the comments section below; or at our Community Forum; and I will be glad to answer.